McCreary County Museum, Historic Stearns , Kentucky. Information, Photos and Reviews. Located in the heart of Historic Stearns, the McCreary County Museum is housed in the old Stearns Company Corporate headquarters, built in 1907. The Museum, founded in 1988, invites everyone to visit and explore the unique history of one of America's best preserved company towns. Historic Stearns was a hub of Kentucky's rich coal history in a town built during America's Gilded Age. A ride aboard Big South Fork Scenic Railroad will deliver visitors to Blue Heron, an interpretive coal camp ran by the National Park Service. A park ranger will greet your train. Train fare offers you discounted admission to the McCreary County Museum, where you can explore coal, lumber, and railroad history, as well as exhibits on life throughout the ages. Historic Stearns also offers many outdoor adventures, including golf on the state's 2nd oldest course and meals at Whistle Stop Cafe. 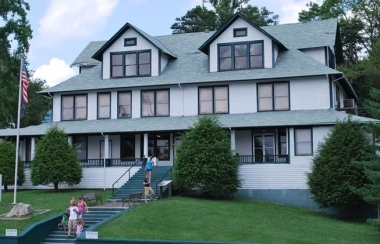 Located in the heart of Historic Stearns, the McCreary County Museum is housed in the old Stearns Company Corporate headquarters, built in 1907. Nobody has reviewed McCreary County Museum yet, Be the first. You are submitting a booking enquiry. McCreary County Museum will then contact you by email with details of availability and prices.